Wedding Donations And A Muddy Run…. We cannot thank Sarah and Mark enough for making a donation to the Trust to mark their recent wedding. 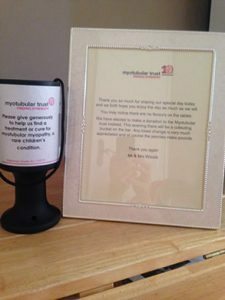 Sarah and Mark very kindly chose to make a donation to the Trust instead of having wedding favours. They also collected donations from their wedding guests throughout their special day. 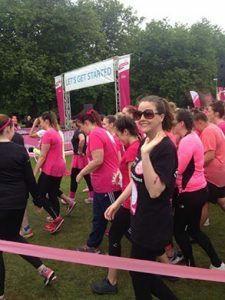 And as well as that, Sarah ran the Pretty Muddy Race for Life at Sefton Park in Liverpool, raising a wonderful amount in sponsorship for both Myotubular Trust and Cancer Research – both charities that are close to Sarah’s heart. 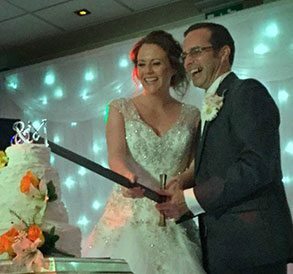 We wish Sarah and Mark all the happiness in the world and extend our heartfelt thanks to them and their guests for their generosity and support. And congratulations to Sarah on completing the Muddy Race!